The early Medici, in sharp contrast to their archducal descendants, were fairly publicity shy. Cosimo il Vecchio, the richest man in Europe, walked about the streets in simple attire, and never with a bodyguard. But in the 1440s, when his business became too big for his father’s house in Piazza del Duomo, he decided it was time for a new palace, bought a site on the widest street in Florence and asked Brunelleschi to design it. His wooden model was so splendid that Cosimo was embarrassed, and asked Michelozzo to come up with something more discreet. Brunelleschi in rage broke his model into bits. Michelozzo’s palace was a landmark in Florentine architecture. Until then, the mansions of the elite resembled little fortresses (see the Palazzo Spini, in Piazza Santa Trínita); Michelozzo did away with the towers and battlements, and instead created a far more classical structure. One of his innovations was the rusticated ground floor ‘to unite an appearance of solidity and strength, with the light and shadow so essential to beauty under the glare of the Italian sun’. 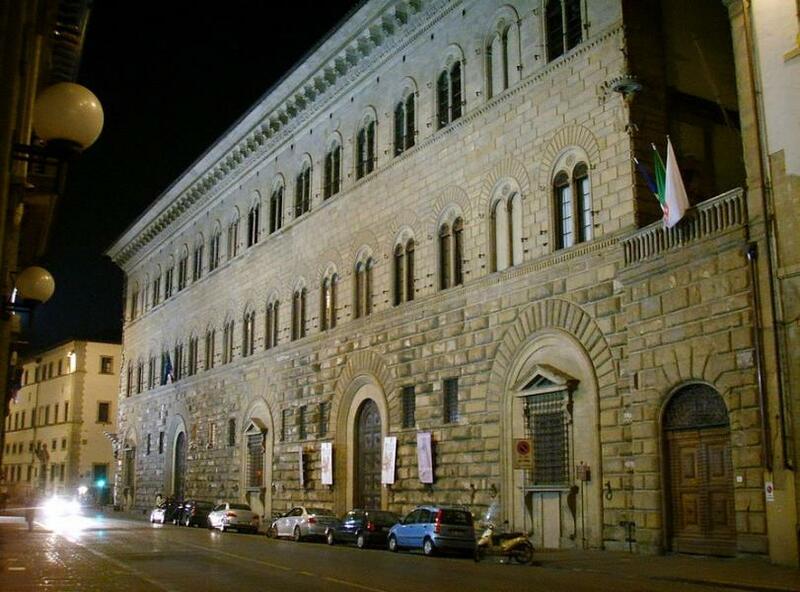 This was the Medici bank headquarters, where Cosimo stowed his florins, and it originally had no windows. The two upper floors, where the family lived, are considerably lighter with their arched bays of windows; the top floor was originally an open loggia (the ‘kneeling windows’ that glassed it in were designed by Michelangelo) and the huge overhanging cornice was inspired by Roman temples. Other Florentine palazzi, like the Rucellai, Strozzi and Pitti, would be far grander, but stylistically all begin here with Michelozzo. This would be the principal address of the Medici for a hundred years, home to Florence’s unofficial court, where ambassadors would call, kings would lodge, and important decisions would be made, until Cosimo I abandoned it in favour of larger quarters in the Palazzo Vecchio and the Pitti Palace. In 1659, the Riccardi purchased the palace, enlarged it and did everything to keep it glittering until Napoleon and his debts drove them to bankruptcy in 1809. The palace is now used as the prefecture. 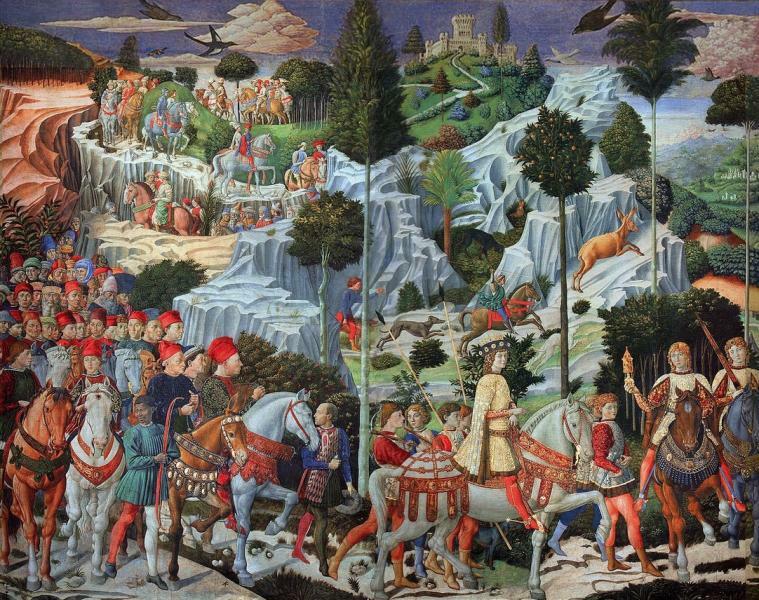 In their day, the Medici lived with the likes of Donatello’s delightful David, and his Judith and Holofernes, Uccello’s Battle of San Romano and other masterpieces now in the Uffizi and Bargello. Frescoes are much harder to move, however, and the Palazzo Medici has one of the most charming ones in Italy, Benozzo Gozzoli’s 1459 Procession of the Magi, located in the Cappella dei Magi upstairs. Painting in a delightful, decorative manner more reminiscent of International Gothic than the awakening Renaissance style of his contemporaries, Gozzoli created a merry, brilliantly coloured pageant of beautifully dressed kings, knights and pages, who travel through a springtime landscape of jewel-like trees and castles; wrapped around three walls of the small chapel to create a glowing fairytale world, gold and lapis lazuli. The ‘Three Kings’ lead the annual pageant of the Compagnia dei Magi, Florence’s richest confraternity. Actually there are more like 33 kings: a whole cavalcade of the great and good (or the rich and powerful) wends its way down a steep valley on the way to Bethlehem. Most of the identifiable figures are of the Medici family, or celebrities who came to Florence in the Council of 1439: on the wall in front of the altar, surrounded by pages, is the melancholy Byzantine Emperor John VII Palaeologos in his unique head dress, while behind him ride three teenage daughters of Piero the Gouty. Their 10-year-old brother Lorenzo il Magnifico is the idealized young king in front, dressed in gold (note the Medici balls on the horse’s trappings) followed by Cosimo il Vecchio on the white horse bearing the motto ‘semper’; his brother Lorenzo rides next to him on a mule. The Magnificent Lorenzo’s younger brother Giuliano rides the pale horse with the star, and next to him, their hatless father, Piero the Gouty. Gozzoli, who would never again paint anything as splendid, certainly had no qualms about identifying himself among the crowd of figures in the back ground, between two Greek scholars, with ‘opus Benotii’ written on his red cap. In the foreground, note the black man carrying a bow. Blacks, as well as Turks, Circassians, Tartars and others, were common enough in Renaissance Florence, who could legally be bought as slaves after a plague in 1336 left an acute shortage of servants. By the 1400s, however, contemporary writers mention them as artisans, fencing masters, soldiers and one famous archery instructor, who may be the man pictured here. The altarpiece, a Madonna by Fra Filippo Lippi, has just been restored and is now housed in the room dedicated to Sidney Sonnino. This forms the antechamber to the other room of the palace opened to visitors, the Gallery, located up the second flight of stairs on the right from the courtyard. It’s hard to imagine a more striking contrast than that between Gozzoli and the Neapolitan Luca Giordano (nicknamed Luca fa presto or ‘Quick-draw Luke’), who painted this hilarious ceiling for the Riccardi in 1683, as a left-handed compliment to the Medici for selling them the palace. No longer mere players in a religious pageant, the Medici, or at least the overstuffed Grand Duke Cosimo III and his unspeakable heir Gian Gastone, take the leading roles, defying the laws of gravity and good taste in an apotheosis of marshmallow clouds.